Lancia gained true fame in the United States when Top Gear declared it the one maker that had the most truly great cars. And they weren’t wrong – the 037, the Stratos, and the Delta Integrale among the greats. Lancia’s mostly thought of as a dead company, but it still exists. Just barely. It really is hard for a car company to be more eligible for the title of “Just Barely Existing” as Lancia. 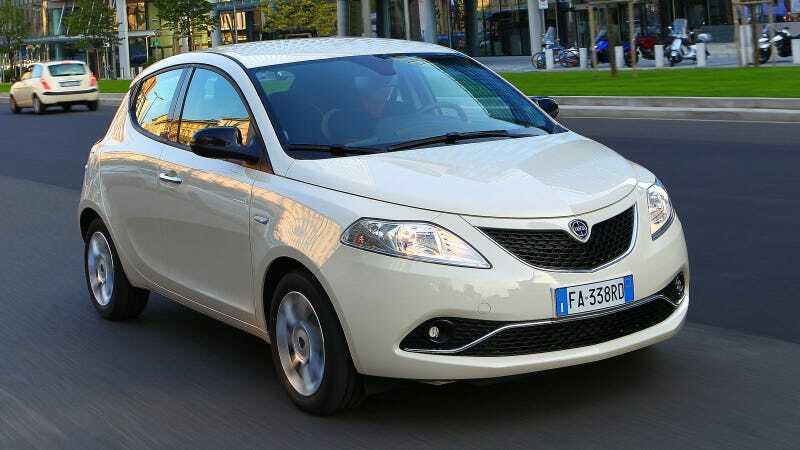 It only has one car in the entire lineup, the Lancia Ypsilon seen above, and even that could be thought of as a slightly-more-luxurious Fiat 500. And more than that, it’s only sold as a Lancia in Italy. Everywhere else, it’s just a Chrysler. Lancia’s slow, sad circle of the drain can be traced back to a fundamental question. What is Lancia? Is it a maker of weirdo cars? Is it a maker of super-analog sports cars? Is it a maker of luxury cars? A lot of manufacturers, when faced with this conundrum, would somehow be able to hold two ideas in its head simultaneously like many normal adult human beings. Porsche, for instance, can make a diesel SUV and also the 911, and that’s fine. But not Lancia. So after it was done making rally cars when it finished building the Lancia Delta hatchback in the early 1990s, it went all-in on being a luxury-ish carmaker. And it did that for a little while, but only a little while. There was the Lancia Delta III, which was a re-worked Fiat Bravo. The last big luxury Lancia, the Thesis, was sold until 2009. It wasn’t even really based on anything else in the Fiat SpA lineup, either. Just sort of its own thing, true to Lancia form. Lancia has soldiered on in the Italian market zombie form, briefly selling the Lancia Flavia (a re-badged Chrysler 200 Convertible), the Lancia Thema (a re-badged Chrysler 300), and a Lancia Voyager (which was a Chrysler Town & Country that just re-used the Chrysler Voyager name). But not even Chryslers were badged as Lancias after 2014. When I think of Lancia, at most I think of the old school rally cars. And that’s it. So to see a Lancia logo in a modern infotainment screen?